How do you turn the audience into paying clients? After all, not everyone’s going to sell an online course and make millions in their underwear. It’s not just her story (although you’ll hear it and it’s a good one), and it’s not just her opinion. She researched top performing businesses that have followed the audience model. Not all approaches are the same and not all approaches fit every business. In Entrepreneurial You, Dorie gives you enough different perspectives and successful methods for building an audience and turning it into paying clients that you’ll find a path that fits your situation. In this episode we are talking again with Dorie Clark. Dorie is an adjunct professor at Duke University’s Fuqua School of Business. She’s the author of Entrepreneurial You, Reinventing You, and Stand Out, which was named the number one Leadership Book in 2015 by Inc. Magazine. She’s done all kinds of stuff. She’s a former presidential campaign, spokeswoman, and a person the New York Times has described as the expert at self-reinvention and helping others reshape their lives and careers. She’s a contributor to Harvard Business Review. She’s spoken at Google, Microsoft, and the World Bank. I finished reading her latest book, Entrepreneurial You, and it’s outstanding. We get a chance to talk about that. Welcome back, Dorie. You’ve been busy. It’s been nine or ten months since we spoke last. You’ve had all kinds of things going on. You launched a course; you’ve released a new book. Why don’t you catch us up a little bit. For those who didn’t hear the first interview, give them a little bit of background on how you got to this point in your career. I started my business eleven years ago. The short version of how I got to where I am in the books that I write is that the minute that I launched my business, which was being a marketing strategy consultant, it’s like if you buy a Volkswagen, all you see are Volkswagens. I suddenly realized that everybody in the entire world was a marketing consultant, and this made me panic terribly. I realized I had to differentiate myself in the market and I had no idea how to do it. I went on this quest which ultimately led to me writing three different books about essentially how people can do that. The first one, Reinventing You, is about how to reinvent yourself into the place you want to be professionally. Stand Out is about how to become a recognized expert in your field, distinguish yourself and get a premium positioning in the marketplace. My latest book, Entrepreneurial You, is a culmination of all that which is how to make money, how to hopefully make serious money from doing all this. I interviewed 50 plus very successful entrepreneurs, six, seven, eight-figure entrepreneurs about real specifics on their business models and what they were doing so that I could learn from them and then hopefully share that information with other people as well. It’s interesting watching the journey through the three books because I’ve read them all. It’s almost the first two you were writing as you were along the path and at earlier stages. This book feels like it’s the overview and almost encompasses all three, but still with a heavy focus on how to monetize it all. You talk about how to promote yourself and how to stand apart from the crowd a little bit. You talk about how to make that shift out of whatever career you’re into, more of an entrepreneurial career in this one, which I thought you started to look at in your first book, but this brings it all together. The time that’s gone on over the course of these three books, what has that done to refine your picture of things? You’re exactly right. I started my career years ago as a journalist. My impulse has always been that I write in order to learn. If there’s a topic that I am interested in or want to immerse myself in, my answer is usually, “Who can I talk to about this? Who’s doing this? How can I glean the information from them?” In fact, that’s a strategy that I talk about in my book Stand Out that these days, really successful people, you just get barraged with these kinds of seekers saying, “Can I take you out to coffee? Can I pick your brain?” and after a while it gets overwhelming. You can’t do it. You don’t want to do it. The question is how do you break through? How do you learn from the people who know how to do it best? I realized writing a book is a pretty good way to do it. People aren’t necessarily going to say, “Come interview me and ask prying questions for an hour. Sure, why not?” but if you say, “I’m writing a book, I have this book contract. Would you like to be in it?” Literally, every single person I asked said yes. It was a great way to open up the windows into it. I did use myself in many ways as the guinea pig in the book. I was already having a good, healthy six-figure income prior to writing it. Like all of us, you hear about friends and colleagues who were bringing in millions of dollars and I thought, “What are they doing? That’s amazing.” I figured I would interview them. As part of the journey of the book, I would write about how I applied the principles to my own life and business. You alluded to me launching an online course, which I did in the last year. That was one of the drivers. I started doing some live events. These were all things that I played with and experimented with. The bottom line, talking about, “Does it work?” I tested the principles out on myself. I was able to increase my income by $193,000 over what I had made the previous year by using the techniques that I write about in the book. I felt good about learning these things and hopefully sharing them with other people so we can magnify that impact. It felt good learning these things and sharing them with other people so we can magnify that impact. You’ve done something interesting here, but it’s not necessarily easy to translate. I want to talk about that for a minute because it’s one thing to go around and interview people who have been successful and look at what they’ve done. By the time you’ve done that with ten people, for example, you now have ten different pictures of what success looks like. Sometimes it’s hard to deconstruct that, reverse engineer the things that worked and then apply them to your own situation. Obviously you’ve done that over the last year with the advice that you got. What’s been difficult? What did you find that maybe was easier than you thought it was? After going through that, what did you learn about the process? What I was searching for in terms of a common denominator that could translate to people was what are the foundational principles behind it? Sometimes people might say, “Dorie, are these techniques going to last? Are podcasts going to be a thing forever?” I have no idea. It’s possible some new technology is going to take over and render podcasts obsolete, although I strongly doubt it in a sense that radio itself is merging with podcasts and television certainly did not kill radio. This is a technology that has persisted for years. Any particular channel that you’re using, the specifics may vary in the future, but their foundations that if someone is a strategic entrepreneur, they can apply to the present moment. One of the things that is critical and this is something I go into depth talking about with online courses but it applies to almost anything, is that probably the primary mistake that people make in launching entrepreneurial ventures or new products or services is that they cook up something they think is cool and then they unleash it on the market and say, “Here people, here you go,” and it fails. They’re like, “Why did this fail? This was a brilliant idea.” You thought it was a brilliant idea, but apparently other people did not. This is hard because entrepreneurs are excitable people and we get hopped up on our ideas. Going through the disciplined process of saying, “I have this idea. This is not necessarily the greatest idea in the world. It is a hypothesis. Let me test the hypothesis. Let me survey my audience. Let me run a small pilot. Let me see if people are willing to pay for it first in a small way. If they are, then I can double down on it and do more of that.” By the time you go through that process for almost anything that you do, you are going to weed out a very large percentage of the error margin. You’re not going in whole hog and hoping, you have been testing along the way so that you’re making huge unfounded bets. That will save you from a lot of problems down the road in any entrepreneurial pursuit that you do. It’s really hard to do that though and you mentioned that. I see all the time as we talk with business owners, this desire for certainty is so strong and I don’t think it exists. Everything is an experiment because anytime we get out there and we think we’re certain of something, it’s easy to get proven wrong and sent down a rough path. It’s difficult to discipline yourself to want to do that. Looking at what you’ve been able to take out of the research that you did and then you implemented it, you had to prioritize the different steps to take. You talk about building audience and a bunch of different ways to do that. You talk about how to roll out products and some similar approaches to do that. If you had to lay those out in terms of a framework, where would somebody start, do you think? Broadly speaking, if we zoom back to the highest level, ultimately, there’re a few steps along the way. The first one is actually way before you get to any product or service. It’s about building trust with your audience. If your business is that you’re selling a commodity on Amazon or something like that, it’s less about necessarily trust with you, but even so people are looking for reviews. You’re on eBay. They want to know that you’re not going to take their money and run away. That is a form of trust building. Especially if you are running the business that is related to something that is either expensive or requires a bespoke element to it, they want to know that you are a reputable person and that is a process that that takes some time to develop and you do that in two ways. One, I’m a big fan, and this is a drum that I beat in my other books as well, of content creation. That is the best way in terms of the invisible work that we do in the service economy to make it manifest. It is very hard for non-insiders to know that you are good at marketing or that you are good at legal services or whatever your thing is because they don’t know how to evaluate that properly. The only way that they can do it, short of talking to someone that you have worked with previously, testimonials, referrals, that’s all great. If they want to investigate it for themselves, the best thing that they can do is read or somehow consume content that you have created so they can get a feel for who you are and how you think. The truth is you can’t immediately go to that. You need to understand your customers deeply. Oftentimes that involves a detailed process before you even start leveraging it in a big way of doing elbow to elbow work, coaching, consulting, or at least deep focus groups so that you understand the language they use. You understand the problems people are having so that you know what they need and you know how you can help them. It’s only then that you can begin to fully leverage it with the power of the internet and be sure that you’re offering people something that they want. The number one problem our clients have is that they’re not seeing enough people. We boil it down to lead generation but they would describe it as, “We don’t see enough people.” They look for all of these different ways that are popular now to go and do that on the internet, but the problem with that is most of the time you’re communicating with strangers. The vast majority of businesses in the world don’t need 10,000 customers to be successful. You need ten. For a lot of people who are going to read your book and go out and start an entrepreneurial venture, if they could get that critical five, ten or fifteen new clients, they’d be off and running. They look at the methods that are taught and those methods are great if you’re going after thousands. There’s nothing wrong with going after the thousands, but to get going, you really need to get the ten right away. There are probably ten people around you that trust you that you already have a relationship with that you can go to. You talk about this in the book. Focus on the resources that you’ve got, the relationships that you’ve got, and see how you can go in and make those things pay right now to make this whole thing sustainable. Those other leverage efforts, they come in later. They’re important but to your point there, they’re much more difficult to make work if you haven’t done that close in homework and gone deep with the people you’re trying to serve. Tying in with that, sometimes professionals hesitate to even embark upon content creation because they say, “This is pathetic. I put something on LinkedIn and it got 100 likes. I need 1,000, I need 10,000, I need 100,000. Why am I bothering?” They get discouraged and they give up. Sure, if you’re selling a $2 fidget spinner or something like that, then yes, you need thousands of people. You need a mass audience. If you are selling a high ticket item, a high margin product or service that is trust based, it doesn’t matter if 100 people read it. If they are the right 100 people, that blog post could get you a $50,000 contract. The way that people need to think about this early on, yes it is great and it is the cherry on top if it can get you new eyeballs. Go for that for sure, but what it is even better for early on is closing the sale better and faster. If you can create content that shows that you’re an authority and if you’ve got somebody that’s a possible interested prospect and you say, “That’s funny that you mentioned that. I just wrote a piece about that. Let me send it to you.” They read that, they say, “Steve’s already been thinking about this. Steve already has these great solutions that seemed perfect for me. Obviously, I should choose Steve.” It makes everything worthwhile. When creating content, if you build it from the close of the sale out, it almost always works better. You said something really important and it’s not talked about much. When creating content, if you build it from the close of the sale out, it almost always works better. You’ve already got people who are warm around you and you can feed them with that content. If you remember Billy Mays, the guy wore the blue shirt and would demonstrate things on late night TV and sell products, they had rules about what they would take on as a product. The number one rule was you had to be able to demonstrate it visually in that commercial. If you think about that principle, it’s really important but for those of us in service businesses, it’s almost impossible to do that. We had an air conditioning problem in Florida a couple of months ago, it’s a really bad thing. We were looking around for an air conditioning company and we had to connect all of this stuff. We ended up going with the one that had some content on their website that addresses the problem that we were having. They were able to demonstrate to us that they thought through that issue. We instantly trusted them more. It’s not that the other companies weren’t good companies, they’re probably great companies. Some of them didn’t have websites. Some of them even if they did, it really didn’t look all that well thought through. Here’s this one that stood out because of that. If you can do that every day as fixing an air conditioner, if it works there, it’s going to work pretty much anywhere. The goal as you’re thinking about doing this is, “How do I demonstrate everything that I know?” That’s scary for people. The big pushback we get is if we tell them how to do it, they’re not going to want to do it. Yes, because they’re just going to read that article and fix that air conditioner themselves. I think that’s a great example because you could literally write an article about like, “Kids, here’s how to fix your air conditioner.” I guarantee you, if Steve is sitting there in the middle of Florida with a broken air conditioner, he could read that article and do it. He is not going to do that. Maybe you have this outlier that could not afford to pay someone to do it and so they’re like, “I’m going to do this myself because I literally have no choice,” but anyone with discretionary income, that is your target. You only want to sell to people who have money to buy. It’s a mindset. We call them the do-it-yourselfers. Our advice to clients is not to worry about them. The do-it-yourselfers are never going to be what I call an ideal client. They’re probably never going to be a client. Let them take it and do it because even if you give them the information and they go and do it, you don’t make any money on that, you’re going to create goodwill in the marketplace if nothing else. They may talk about you and they may refer someone else to that piece of content who isn’t a do-it-yourselfer, who maybe has a little more common sense than that and is going to pay an expert. There’s no downside in it but it gives you this great advantage of being able to demonstrate what it is that you do and what you know. When I started out, I’m probably a little older than you are Dorie, I’m 46. I started in business in 1994. We didn’t have the internet in my company when I went there, it took a year to get it. The idea of publishing information the way that we’re talking about right now and doing it, “We just make content,” it wasn’t possible at the time. You could write things, but nobody would ever see them unless you were going to stick them in an envelope and put a stamp on it and mail it out. Yes, there were publications but you had to get in the publications because there were a few. It was competitive. The outlets weren’t there for you to do this demonstration but now it’s very easy for you to anoint yourself and go and do it. I’m with you. I remember in 1994, I did not yet have the internet either and a friend was way ahead of the curve. She told me that she had this new job and she was designing web pages. I was confused, I kept asking her, “Where are they? Where can I find them? I don’t understand.” Finally, she printed them out and mailed me printouts of the webpage so that I could see what she was doing. It was an entirely different world. Now it’s like, “There’s no excuse. You don’t even have to have your own blog. It’s easy to have a blog. You can set something up on WordPress and for $13 a year you can have it routed to your website so that you can host the blog on your website. Even if you don’t want to do that, you could blog on LinkedIn, and have that come up right by your profile. It’s super easy. Anyone who can do word processing can do that. There are so many advantages to it and it does allow people to build trust in a way that you weren’t able to do before that. Definitely, we both agree it’s almost like a must do for businesses these days. You talk in the book about making the shift to monetize. When I got to that part, I chuckle a little bit because to me, that’s a whole new development in business where people were reluctant to sell stuff. I’d love to talk with you a little bit about that because you spend a little bit of time on it. I’ve got an opinion which I’ll be happy to share but I’d love to get your take on this whole idea of monetization being a scary thing. So much more of the world is becoming entrepreneurial, either voluntarily or involuntarily. Because so much more of the world is becoming entrepreneurial, either voluntarily or involuntarily, we’ve all heard the studies. Right now, 35% of the American workforce is freelancer or contractor. It’s going to be 40% within a few years. This emerging trend that is not going away. That is relatively new in the past twenty years. The people who are entrepreneurs twenty years ago probably we’re a little bit more of the, “I’m going to get out there and sell,” just like these slightly different personality types. I love entrepreneurship. I’m totally all in it now. I originally was probably not going to do this. This was not my initial chosen path. I was a reporter and I got laid off and I was like, “I thought I was going to be a reporter,” and it didn’t happen. I had some other jobs after that, I was on political campaigns. They all kept losing so you have to become entrepreneurial anyway. Entrepreneurship is opened up to a lot more people that maybe would have been corporate employees in the past and may in fact have been brought up with attitudes like I was. I remember my mother, she would talk about salespeople like this terrible object of contempt. Even when I was supposed to be going around and selling stupid cookies or whatever as a fundraiser for my school, she was always like, “I can’t believe they’re making you sell.” It was this terrible stigmatized thing. A lot of us have that baggage and if we’re going to be successful, we have to learn to get over it to realize that sales is a normal, natural, and good thing. It is what makes the world of business go around and we can’t pussyfoot around it. Otherwise, we are going to be doomed. Some people assume it means you have to sell your soul and I want to push back against it because, clearly, you don’t. There’s the saying, “People don’t like to be sold to, but they like to buy.” If we can make it so that people understand that selling can be a pretty chill thing. If you do it right, if you do your marketing right, it’s like, “Let’s make myself available so that people can buy from me,” then it becomes pretty cool. What is your theory, Steve? I would like to know. First of all, you have to sell something because you got to eat, your kids got to eat and you’ve got a family. Most of businesses have employees, contractors, and all of that. I’ve had close to 50 employees and now we’re pretty lean. I always felt a strong responsibility that part of what my job was to make sure that the conditions were there for those people to be successful in their lives. That can’t happen unless you sell something and make money. That’s a factor of life, but where all of that breaks down, where people get that queasiness about selling, it’s when they’re selling to somebody who isn’t interested. So much time, energy and effort has been spent. In the past twenty, 30 years ago, it was a lot more difficult to get in front of somebody who was pretty interested, maybe not. Now with all the tools we just talked about, to put content out there and attract to you the people who are interested in what you’re selling, there’s no reason for it to have that stigma anymore. All you’re doing at that point is taking somebody who has been educated, motivated, and now they want a solution and all you got to do is fulfill that solution for them. The selling part should be easy. That’s assuming you’ve done everything leading up to that. I come from that approach because since the mid-90s, I’ve been doing content marketing. We didn’t call it that, but we used to go give speeches and used that to educate people and demonstrate what we knew. Sure enough, we’d have a line of people wanting to do business with us after doing that. We were able to build trust and do all the things that we’ve talked about. Which is why I don’t think any of that’s going away. The tools for doing it have gotten dramatically better, easier, and less costly for you to get into. You’ve got an obligation to sell. People need what you’re doing. If you’re reading this, obviously you’ve created some solution for somebody that has some usefulness. You’ve been in business for a little while, you got to sell it to them. It’s good for them and it’s good for you. That’s my feeling on selling. I highly recommend to our audience you go get the book, no matter what stage you’re at in your journey. The way Dorie has broken down the different parts of this process, I guarantee you you’re going to get something out of it. I took margin notes as I was going through and I’ve got to go back now and implement a few things that I picked up in there. No matter where you are, this is going to be a useful book. Dorie, where’s the best place for them to get started? Get a sense of a smorgasbord of options for bringing in new revenues through expanding your business models a little bit. Thanks so much, Steve. One thing that I’ll suggest for folks that are interested in building out new revenue streams in your business especially if you run a service based business and is looking for ways to think about tapping into more passive income streams, but getting a sense of a smorgasbord of options for bringing in new revenues through expanding your business models a little bit, I do have a free resource. It is the Entrepreneurial You Self-Assessment workbook and folks can get that for free at DorieClark.com/entrepreneur. The book is Entrepreneurial You out from Harvard Business Review Press and it is available all those good places. Dorie, great to have you back on again and thanks for investing a little time with us today. Steve, thank you so much. Always a pleasure to talk to you. 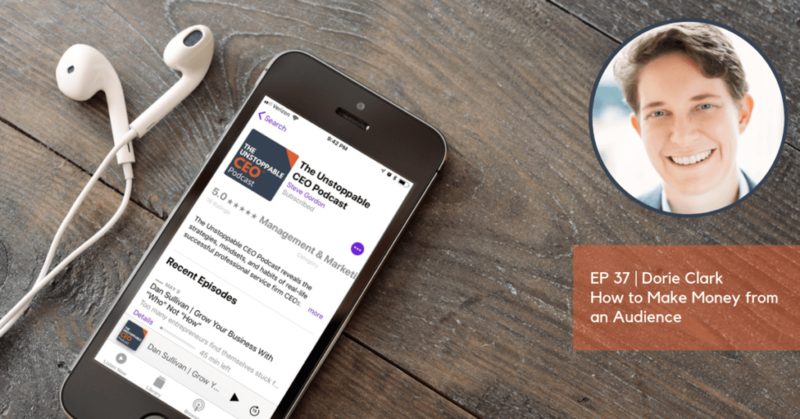 Thanks for listening to the Unstoppable CEO Podcast. Help others discover this show. Leave a review and rating on iTunes at UnstoppableCEO.net/Itunes.